On Sunday, a group of about 80 LGBTQ Central Americans arrived in Tijuana, the first members of a migrant caravan traveling through Mexico toward the U.S. border since October. The migrants had organized within the caravan itself, electing leaders and taking their own census within the larger group. On Sunday, a group of about 80 LGBTQ Central Americans arrived in Tijuana, the first members of a migrant caravan traveling through Mexico toward the U.S. border since October. The group had managed to scrounge together resources for bus transportation to Tijuana and a temporary place to stay in Playas de Tijuana until they were processed for asylum at the U.S.-Mexico border. Often, asylum-seekers report spending weeks waiting to be processed at the San Ysidro Port of Entry. Last week, the Union-Tribune reported that the existing waitlist had swelled at the port of entry to 2,500, with people waiting up to six weeks. On any given day, U.S. officials might process 60 or 30 or even zero people in line. Authorities in Baja California and advocates who work with migrants or run shelters have been concerned about Tijuana’s capacity to house migrants, even temporarily as they wait. Tijuana has roughly 1,400 shelter beds, the Union-Tribune reported, and the city has faced shortages in housing women and children in particular. A network of shelters in the city has already raised concerns about their capacity, saying they don’t want people sleeping on the streets as the temperatures drop at night and where they’ll be vulnerable to organized crime. The group of LGBTQ migrants who arrived Sunday had secured an Airbnb in Playas de Tijuana, an upscale neighborhood on the coast. Outside of the home, they spoke with reporters about their journey from Central America and how they hoped to be processed fairly for asylum. Last week, while being housed in the Magdalena Mixhuca Stadium in Mexico City, thousands of migrants who have been traveling in a series of caravans from Central America voted to travel the longer route to Tijuana’s border with San Diego to seek asylum. The shortest route is to Texas’ border, but it is more dangerous. But as with prior groups that have made the journey in caravans, there is some splintering. For one, there are some migrants who are mostly looking for economic opportunities in the United States and some began plotting ways to go through Texas anyway, the Dallas Morning News reported. The group of LGBTQ migrants left Mexico City on Friday. Since they had managed to get transportation, they arrived in Tijuana Sunday, while the largest group of migrants traveling by foot spent Sunday night in Irapuato, Guanajuato, about 1,500 miles south of Tijuana. 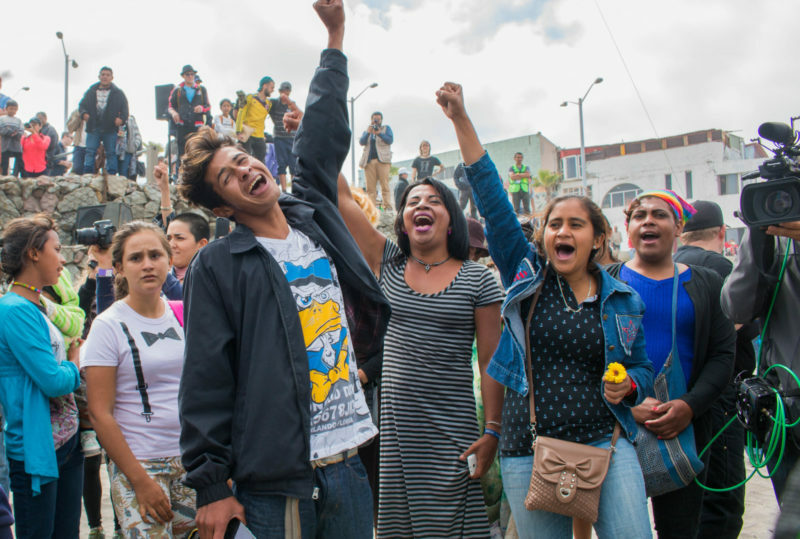 The LGBTQ migrants had organized within the caravan itself, electing leaders and taking their own census within the larger group. It found there were more than 120 LGBTQ people within the stadium where they had been staying. LGBTQ migrants in the larger caravan decided to take their fates into their own hands and figure out a way to more quickly arrive in Tijuana. Upon arrival in Playas de Tijuana, the migrants asked the community at a press conference to help them with water, food, clothes and respect. They also spoke of the discrimination and hateful words they faced on the journey, both from Mexicans and from other members of the caravan who traveled with them. During the press conference, a group of neighbors from Playas interrupted to make clear that they did not want them there. One neighbor said Tijuana already had more than 2,000 homicides this year. Crime is already bad in the city, he said, and he worried that migrants coming would make it worse. Patricia Elena Juarez Hernandez, president of the Playas de Tijuana Neighborhood Association, said at the press conference she was caught off guard by the arrival of the migrants in her neighborhood and questioned why authorities weren’t doing more to take into account the people who already live there. When one reporter asked whether she was discriminating against the migrants, Juarez Hernandez vehemently denied the suggestion. Another woman who lived in the neighborhood ranted about how the Mexican government seemed to be supporting the migrants, who she didn’t trust, according to the video. “How are we supposed to know that someone among you won’t hurt us?” Nakai Flotte, an organizer with Diversidad Sin Fronteras, fired back. As the group of migrants began to leave to enter the home where they’re staying, another woman who lives in the neighborhood followed them to the door, pointing at one individual who was carrying a rainbow flag — a sign of LGBTQ pride. Frontera.info has a full video of the exchange posted on its Facebook page. Buzzfeed talks with some of the migrants from the spring caravan who decided to help those traveling with the current one. “I never thought I’d be back here again, but I have an obligation to help. I don’t like seeing my people suffer,” said one migrant who came in the spring and had been working in Ensenada. The Union-Tribune talks to the incoming head of Mexico’s National Migration Institute — who will start on Dec. 1 — about how Mexico should handle migration from Central America. On Friday at midnight, new restrictions on asylum went into effect along the U.S.-Mexico border. The ban effectively states that those who cross between ports of entry between Nov. 10, 2018, and Feb. 8, 2019, will be ineligible for asylum, explains Vox’s Dara Lind. The policy was swiftly challenged in court by the American Civil Liberties Union and other immigration advocates. The first hearing on the matter will take place Tuesday in Oakland. 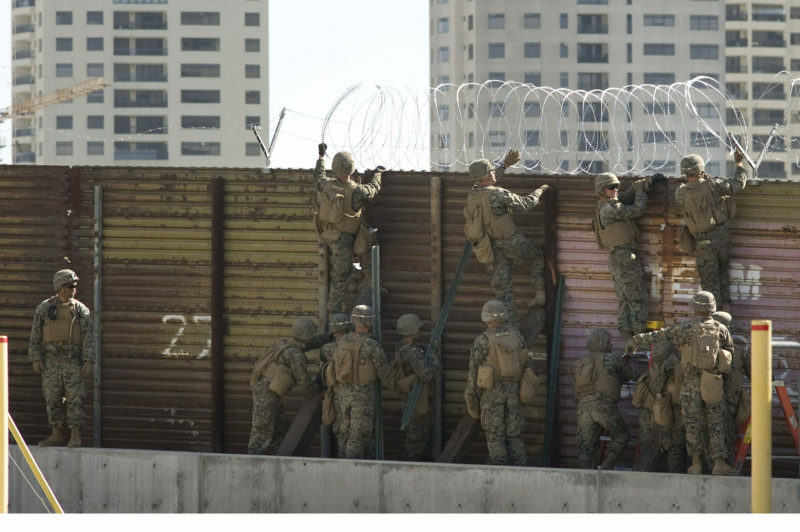 Roughly 1,300 troops arrived at California’s border with Mexico last week in anticipation of the arrival of the latest caravan of Central American migrants, the Union-Tribune reports. 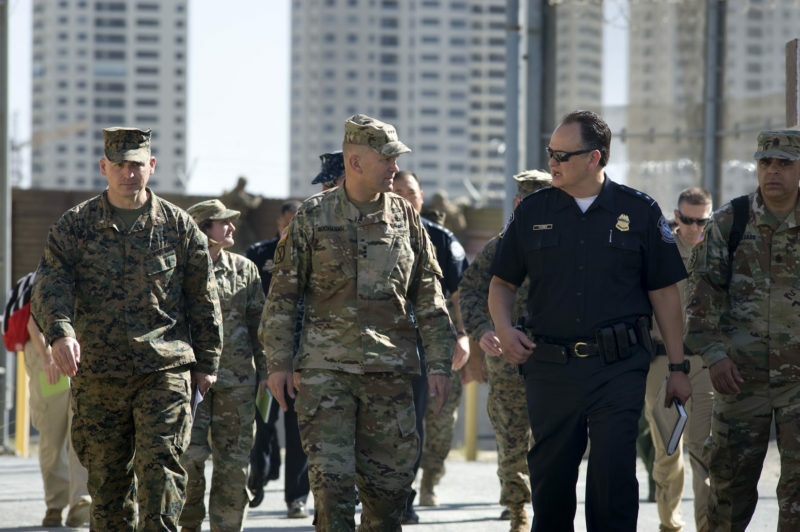 On Friday, at a press conference for Operation Secure the Line, Lt. Gen. Jeff Buchanan fsaid the troops will be acting in a military support role to law enforcement, which means deterring crossings between ports of entry and channeling migrants to the ports of entry. Documents obtained by Military Times said the troops are also wary of armed U.S.-citizen militias, who may take guarding the border into their own hands, and for extreme right- or left-wing protests that could turn violent.